Our mission at Life Restored Church is to reach lives and restore hope through Jesus Christ. We believe in going out and reaching the lives that Jesus died for and restoring the hope that is truly theirs in Christ ,to become a 24/7 church that never closes its doors and a lighthouse to our city. We will be a place that meets every need that our society and loved ones have every day at every hour of the day. We will transform lives to be all Christ died for them to be. 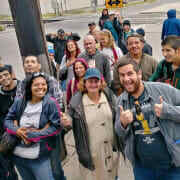 We have been serving the homeless community for 3 years now. We provide showers every Tuesday and Wednesday to our homeless brothers and sisters. We provide breakfast 6 days a week. In the freezing temperatures we allow people off the street to find overnight shelter in our church. We offer an 8 month transitioning program that offers living quarters and curriculum to end homelessness. SAN ANTONIO BAPTIST ASSOCIATION accepts donations. Donate Now. Would you recommend SAN ANTONIO BAPTIST ASSOCIATION?